With little to no support for her to become an athlete, Vinnie Bradford still became an Olympic fencer through hard work, discipline and perseverance. Bradford, a South health and physical education adjunct instructor, competed in women’s foil for the U.S. in the 1984 Summer Olympics in Los Angeles. Foil is one of three weapons in fencing along with epee and saber. “In 1984, women were only allowed to fence in one of those weapons, and that was foil,” Bradford said. That has changed since then, but for her, it was exciting to be an athlete despite her options being so limited, she said. Bradford, who grew up in Fort Worth, attended school before Title IX, a federal statute that protects people against gender discrimination in educational activities and programs, was adopted in 1972. Her high school only had sports for boys. But she wanted to be an athlete. “That was just my calling, to move and play and perform,” she said. Without school sports, Bradford went to a Fort Worth recreation center where a fencing class was offered to adults. She was the only child in the class but showed talent early on, and the coach began to work diligently with her, she said. Bradford started fencing at age 11 but didn’t make the Olympics until she was 29 and took a less than conventional route to get there. At 16, she decided she wanted to be an Olympic fencer after going to Madrid, Spain, for the junior world championships, where she had an “aha” moment. “I thought to myself, ‘Well, if I really got serious about this, I wonder what would happen?’” Bradford recalled. Bradford was determined to be an athlete but lacked support. She ended up dropping out of high school to focus on fencing and pursue her education in a different way. She spent a year taking courses around the Metroplex before earning a GED and then attending TCC’s South Campus for a semester while she figured out her next move. Bradford started college at San Jose State University the year Title IX went into effect and was one of the first women in the state of California to be given an athletic scholarship, she said. She and her teammates won the NCAA national championship four years in a row, which was the first time a female fencing team had done so, and it hasn’t been done since, Bradford said. Fencing shaped Bradford’s life in many ways. 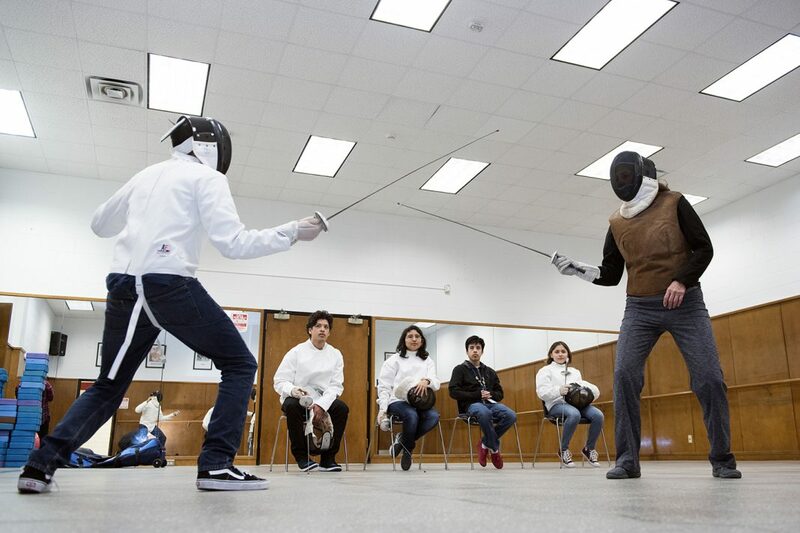 South student Joshua Padilla free fences foil against ECHS student Julio Aguero during a Fencing Club practice Feb. 7. She also learned how to overcome adversity. Fencing was a traditionally male-dominated world and systematically closed off to women, which taught Bradford the value of sticking to her values and standing up for her rights, she said. The U.S. was not a powerhouse in fencing yet, so she didn’t have the strongest coaches or the backing needed to compete at that level, though her coaches still poured their hearts and souls into her, she said. Still, competing at the Olympics was one of the most thrilling moments of her life despite the challenges she faced. Bradford recalled what it was like to walk into the Los Angeles Memorial Coliseum for the opening ceremonies. Bradford described herself as a mediocre international fencer, having finished in 23rd place at the Olympics. The results she’s proudest of were her national results that put her on the Olympic team. 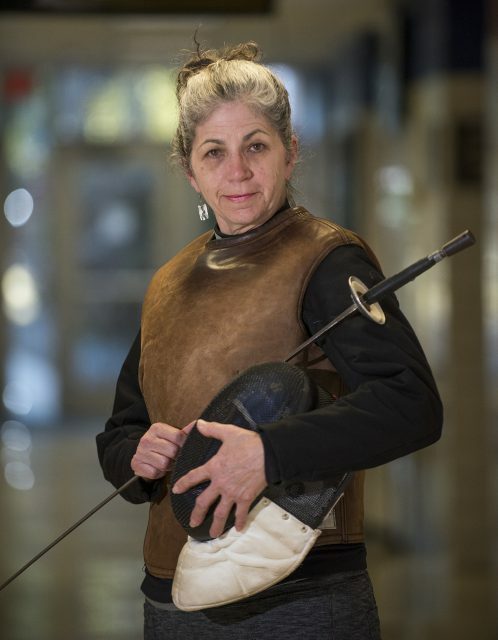 She won gold at the women’s national championship in both foil and epee, which had never been done before and hasn’t been done since, she said. “It opened people’s minds to the possibility that women could be great in a second weapon,” she said. After that career ended, Bradford, like many athletes, had misgivings about what to do next. She decided to return to school to get a master’s in kinesiology. She studied at the University of Texas in Austin, where she taught fencing as a graduate assistant. After finishing her master’s, she taught fencing full time and coached the university’s fencing club. Bradford pursued teaching because she wanted a meaningful job rather than one that doesn’t give back, she said. After UT, Bradford taught for the Alamo Community College District in San Antonio, where she learned to teach other things like yoga. After retiring, she and her husband moved back home to Fort Worth and began teaching at TCC. She is now in her fourth semester as a health and physical education adjunct instructor. Bradford started the Fencing Club this semester with students from the early college high school course she taught last fall. 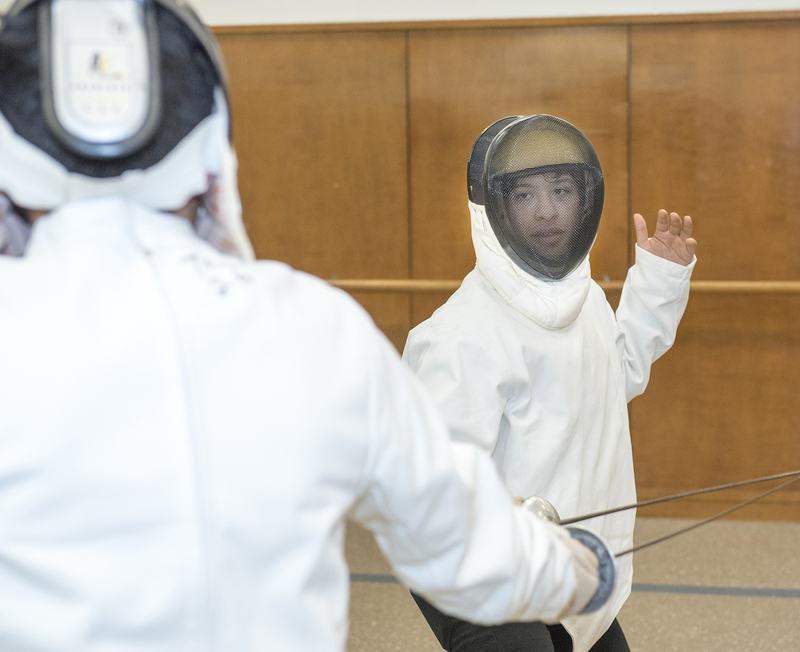 South ECHS student and club member Genesis Delgado said he is appreciative of the guidance and wisdom all of Bradford’s experience with fencing has given her. “Any question that we have, I feel comfortable going up to her and talking to her about it cause she knows it [fencing] so well,” she said. South ECHS student Julio Aguero was approached by Bradford about joining the club because of the interest he showed during the course, he said. He joined because he likes working with her.